Just wanted to let you know that this tasty vegan gluten free dairy free carrot cake is sponsored by my friends at XOBY Organics! 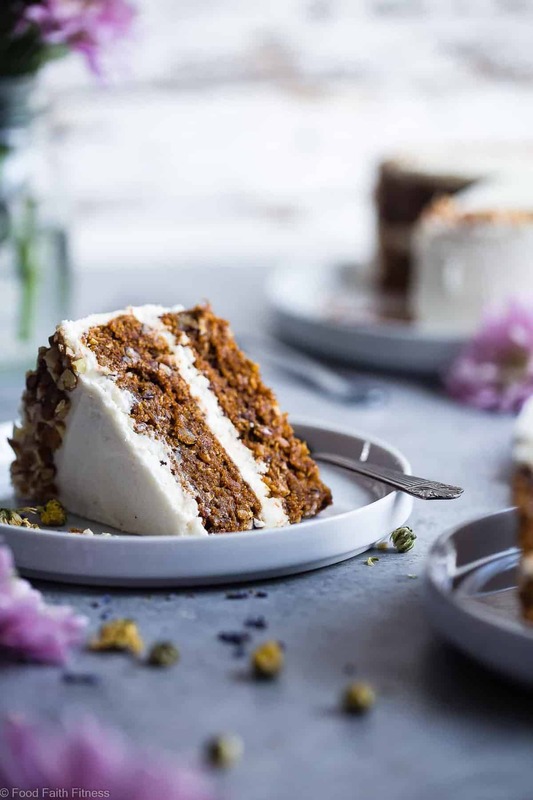 This one bowl healthy carrot cake is SO moist and tender, you’ll never know it’s plant based and made without eggs! Perfect for Easter! The time where we get to eat our vegetables in the form of CAKE. Real life talk. You know I’m all about it. Well, internet friends. It’s the countdown to Easter which means that gluten free CARROT CAKE is up in the HOUSE. SO SUPER moist and tender even WITHOUT EGGS. The lack of eggs we mentioned comes from some kind of magical-baking-wizardry that happens when you stir together water, coconut oil and vinegar. Literally ZERO ideas how that makes sense, but you do not question science. Right? Has no actual strands of grated carrot. This cake has – wait for it – CARROT BABY FOOD. Do not put your baby-food-judgement on a tender, spicy-sweet, pineapple-licious and crazy coconut-y slice of carrot cake perfection. 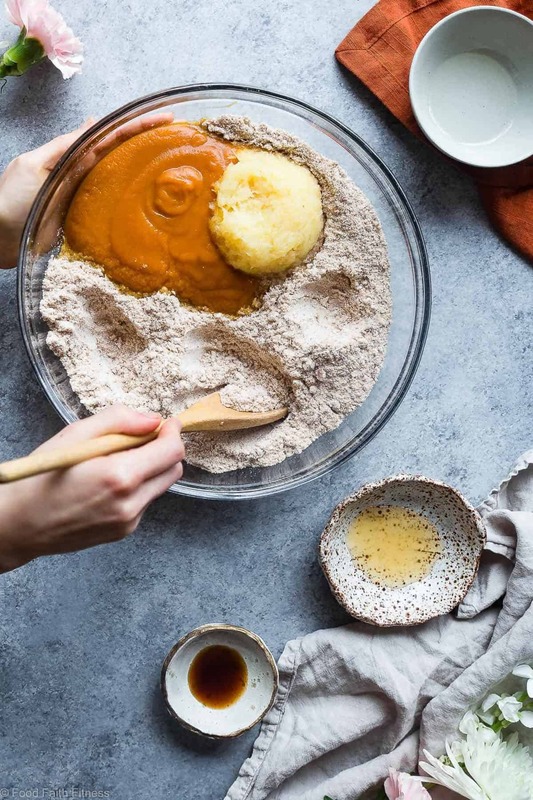 Just like the gluten free vegan carrot cake blondies, the pureed carrot situation is also a MAIN reason why this cake is even able to nix the eggs, while still HOLDING TOGETHER. The baby food acts like the VRY VRY needed binder AND is hugs all the ingredients in tastes-exactly-like-the-normal-carrot-cake-made-with-non-baby-food-carrots hug. 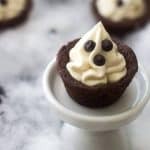 Can we talk about the DAIRY FREE cream cheese frosting that is basically my newest obsession? Literally have been putting it in my morning oatmeal recipe with blueberry cheesecake swirl every day. When I got my package from XOBY Organics and Mr. FFF saw the frosting (context: he is OBSESSED with cream cheese frosting but, due to being lactose intolerant, has not had it in ages) he just assumed that I randomly ordered it for him and started GOING TO TOWN ON IT. Until I made him this vegan carrot cake recipe. Life tip: if you accidentally make some sad/hurt someone’s feelings/just do something not-nice-human-like, just make them this vegan gluten free dairy free carrot cake. PROBLEM SOLVED. XOBY Organics saved the day on the how-to-make-dairy-free-cream-cheese-frosting situation that was at hand <– I couldn’t live with myself if I made you carrot cake WITHOUT that VRY VRY necessary, swirly-twirly CREAMY frosting. 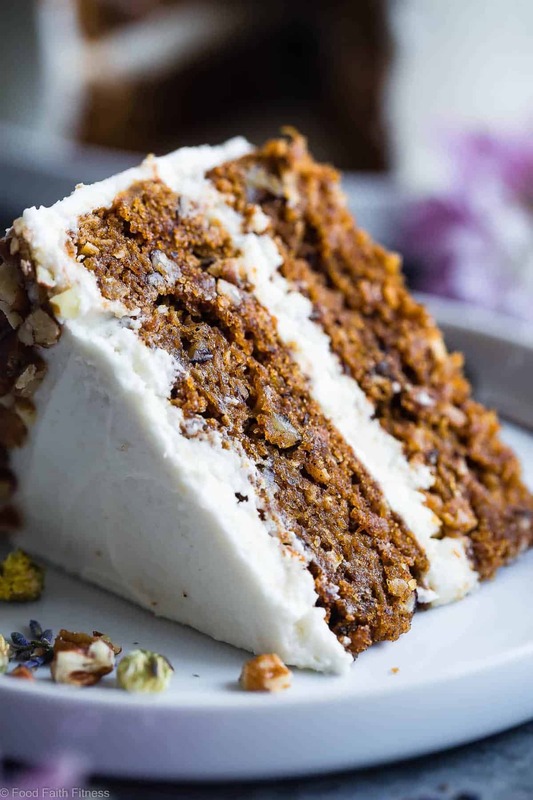 But, if you want to MAKE your own dairy-free frosting, you can check out my Paleo Carrot Cake with Almond Flour! They also saved the day, as per usual, on the WHOLE almond flour carrot cake situation because, just like in the peanut butter chickpea chocolate chip cookies, gluten free magic cookie bars A-N-D strawberry gluten free chocolate lava cakes, the (organic! Wholesome!) cake ingredients were delivered RIGHT TO MY DOOR. And in only a couple days after I ordered them! Cake that comes right to you? UHHH, is there anything else in life worth signing up for? Note that total time does not include cooling the cakes or chilling between frosting layers. 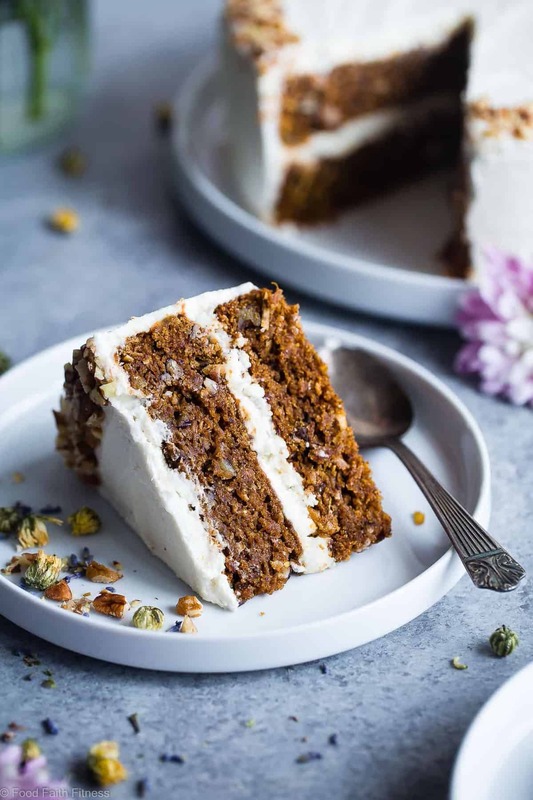 This vegan gluten free dairy free carrot cake is SO moist and tender, you'll never know it's healthy, plant based and made without eggs! Perfect for Easter! In a large bowl, stir together all the ingredients up to the pecans (including the pecans) until well mixed. Add the baby food and pineapple into the bowl, but don't mix. Let them sit on top of the dry ingredients. Make 3 wells in the dry ingredients and put the coconut oil in one, the apple cider vinegar in the other and the vanilla in one. You don't want them to mix together yet. Pour the water over top of everything and use a fork to stir everything together until well mixed. Spread a heaping 3/4 cup of frosting very thinly over the rest of the cake, to seal in the crumbs. It doesn't have to look pretty yet! Refrigerate for 20-30 minutes, or until the frosting is hard. **If the frosting isn't spreadable, microwave for 6-10 seconds. 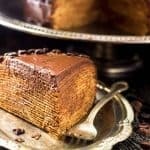 ***If you chill the cake before serving, let it come to room temperature before serving so that the frosting isn't hard. And, make sure you stay tuned with XOBY, because they’re running an awesome giveaway at the end of the month. Until then, take advantage of their promotion that’s running from March 1-12 on their website: register (it’s free!) and receive a $10 e-gift card! Just for signing up! This carrot cake would be the perfect center for Easter! So gorgeous! It will be a highlight of the holidays! Carrot baby food?! That’s freakin’ brilliant! Perfect for people who want a smoother cake texture. Thanks! All the work already done! Carrot cake is my FAVORITE kind of cake! 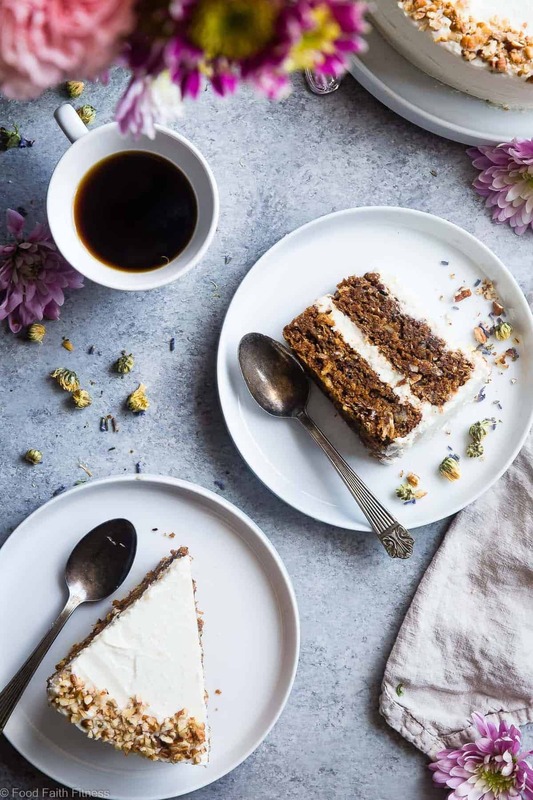 I love lemon, chocolate, lavender, and cinnamon coffee cake, but something about carrot cake just wins me over every time. I remember eating the vegan carrot cake slices from Lassens, which were absolutely incredible but had SUUUUUUUUPER sweet frosting. 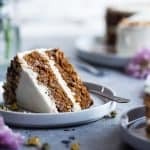 I would love to recreate my own healthier carrot cake that wouldn’t give me such a blood sugar rush, and I’m starting with this recipe! 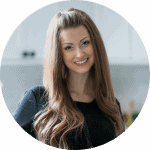 Agreed Cassie – I love finding alternatives to traditionally oversweet desserts – hope you like the recipe. 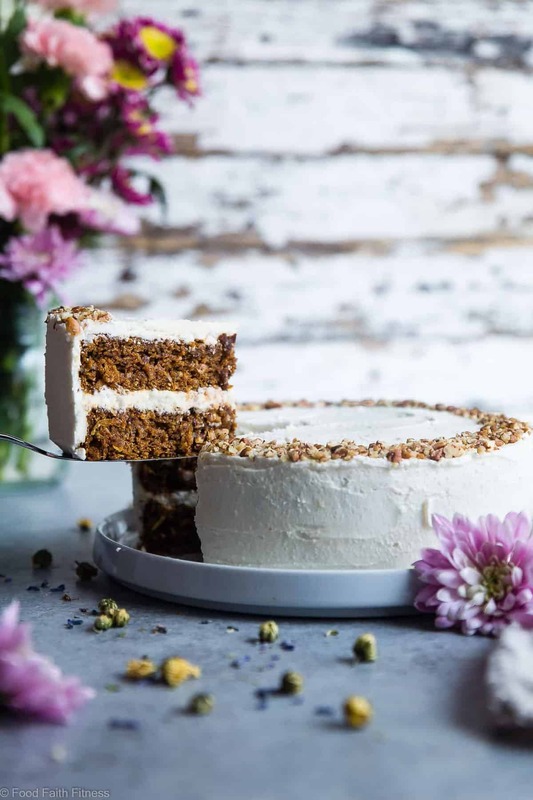 This carrot cake looks so delicious! 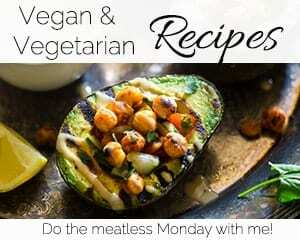 Love that you made a vegan version! This is a beautiful cake! I absolutely can’t wait to make it! The carrot baby food is the secret! I love the idea of having this cake on Easter! Perfect for the beginning of spring. Love me a good carrot cake. A nice alternative to your standard cake flavors and sometimes better when it is really moist! 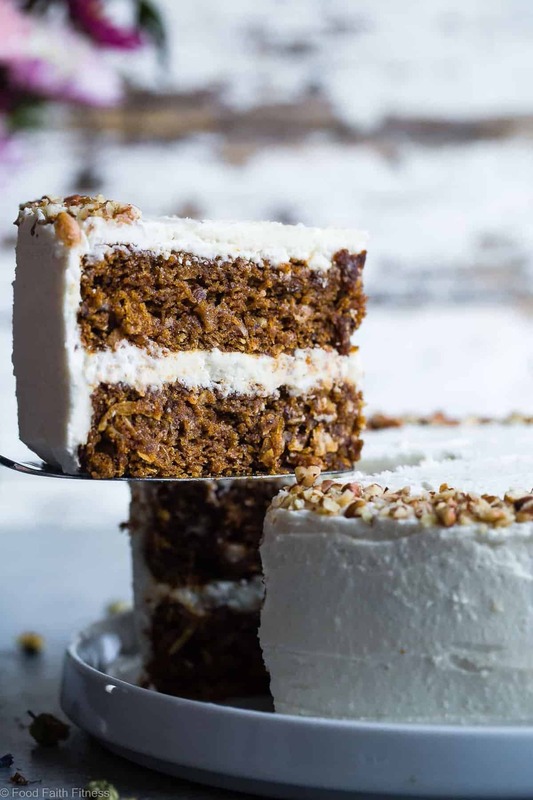 Carrot cake is one of my favorite cakes! Same Meseidy. I love this version. Agreed – I love sneaking in some veggies into my desserts as well. How very lovely. Gorgeous recipe and photos. I am so ready for some spring!! Thanks Brenda – I think we are all feeling ready for spring! I love Carrot Cake. It is so rich. I will have to give this recipe a shot. Fantastic photos!!! I love to hear that Michael – best of luck! Carrot baby food!? You are a genius!!! 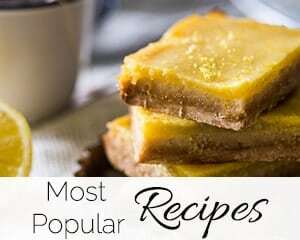 Amazing photos and even better recipe!! I can’t believe this is egg free!!! Amazing! can you make this without the coconut flakes? Hi Taylor! 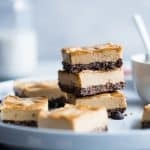 Can you recommend a substitute for almond flour in this recipe? Thanks! 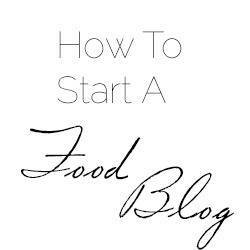 I really can’t as recipes are only tested as written and almond flour is a major part of the recipe – I’m sorry and hope you understand! Hello, thx for this clever recipe! One question, if there are already several binders in this recipe-what purpose does the tapioca starch serve? 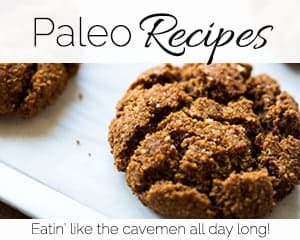 I’m adjusting the rest of the recipe to be lower carb and can’t figure out a replacement for the starch-wondering if it could be xantham gum, ground flax, or a gelatin of sorts?? Is the tapioca just meant to give more bind/support for the cake? TIA! The tapioca is not for binding, it gives the cake a really awesome texture! 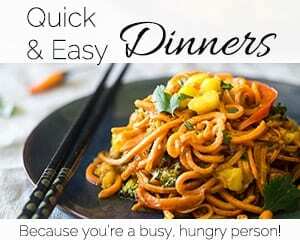 I really can’t tell you replacements as recipes are only tested as written and the starch is a huge part of the recipe. Sorry! I hope you understand. Let me know what you try! So glad to hear this Fiona! Carrot baby food? No thanks. Why not just cook some carrots and puree it? Can I use real carrots in the recipe? Have you tried that and if so how much do you think I should put in? You could try! But I can’t guarantee anything as I’ve not tried – sorry! Let me know if you try! unfortunately almond flour isn’t like any other flour so I really can’t help you here – I’m so sorry! I made this exactly to the recipe and it turned out fabulous. Found only one 8 inch and one 9 inch cake pan in the cupboard (huh?) so I made 24 cupcakes. 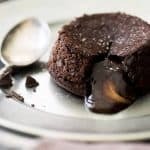 Perfect at 20-25 minutes bake time and lowers the per serving calorie count a little. The batter is quite thick and dry (more like dough–but don’t worry, then end product is nice and moist!) so if I had to do it again I would form it into balls in the cups so the result is a little prettier. Nonetheless the lumpiness gave me permission to frost with a simple schmear and decorate with broken almond pieces. Nice! Happy Mother’s Day to my gluten- and dairy-free friends! YAY! I am so glad you liked it! And thank you for sharing the baking time as cupcakes – I so appreciate that!! Absolutely delicious! 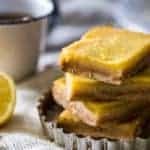 Ive just started cooking and baking gluten free and this is the first recipe I’ve found the doesn’t taste like I’m giving anything up. Thank you so much for sharing! YAYYYYY! I am SO pumped to hear that! Thank you! My husband is allergic to pineapple? Could I leave it out, or substitute with something else? Is it just for flavor? Thanks! I THINK it would work, however it does have some binding properties and the cake may not be sweet enough. I can’t tell you for sure as recipes are only tested as written. Let me know if you try it! I’m allergic to pineapple also, could I replace it with soaked raisins? You can try? I really can’t tell you how recipes will turn out when they’re not made as written – I hope you understand! 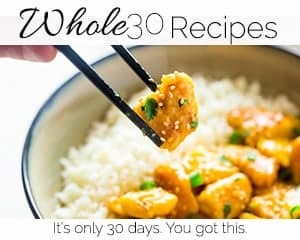 I tried this recipe and wow! Vegan and gf free but fluffy, delicious cake with sweet, fluffy frosting, I felt like it was impossible. This cake is just magical! Thank you so much for posting the recipe. SO glad you love it! Thanks for sharing! First time I’ve ever tried a cake like this, and it was absolutely delicious–unable to tell this was not just a regular cake! The birthday girl I made it for hadn’t had cake in two years since her allergen diagnosis and she nearly cried. Thank you so much for sharing this recipe. This made my WHOLE DAY! Thank you SO much for letting me know!! YAY! I am so glad you like it!!! Just made this as cupcakes and I He first batch is sooooo gummy. Also, cook time is considerably longer than I would have expected. Any advice? Followed the recipe as written. Hmm, I am sorry you feel this way! As you can see by other comments, it’s worked great for other readers, so I am wondering if it might be that you made them into cupcakes? ALSO, did you weigh your flour? I’d love to help you! I made this cake tonight! It was very moist but didn’t stay together well. I used Tapioca Granules instead of the Starch so I think this may have been the issue. Very good though none the less. I tried To substitute coconut flour and tapioca flour for the almond flour because google said it would work. It didn’t. My own fault for not wanting to pay for almond flour. I cut the cake into strips and am cooking additional time on 200 and am making dog treats. My question is would it be wrong to just eat the frosting straight no cake? Yeah I definitely would have advised against that sub! Made this for Thanksgiving. Thank you SO much, it was so delicious. This was my first time making something like this and now I’m inspired to find more to bake! Yahoo!! So glad you loved it Kelly! Fantastic recipe. Used half of the amount of sugar it called for, only 1 can of the frosting, and fresh pineapple instead of canned (and a little extra than called for), and it was the perfect level of sweet. The cake is truly delicious. Awesome consistency. Super flavorful. Grandma LOVED it, too. YAY! I am so glad you liked it! Thanks for letting us know! 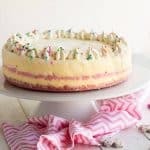 Can I half this recipe to make only one cake?? I plan to follow ingredients and instructions exactly as written.. thank you in advance! It SHOULD work! But, I haven’t tried so I can’t tell you absolutely for sure. Let me know if you try!